We have months to speculate as to how the Skywalker Saga will end, but we do know one thing: It'll be a bit different from how it was originally envisioned. 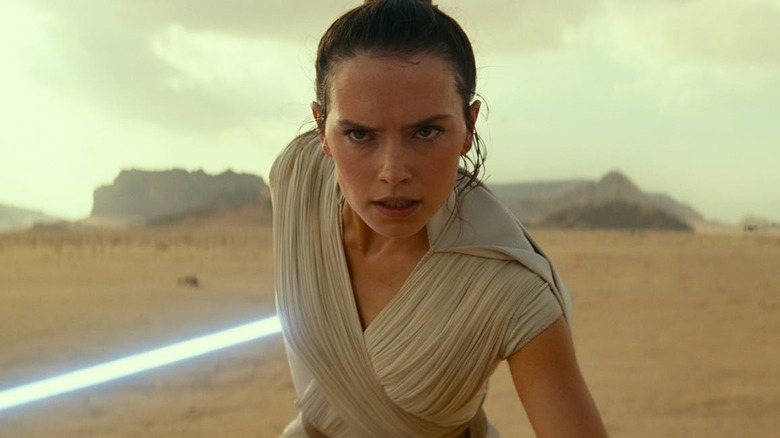 In a conversation with Jake Hamilton, co-host of the ReelBlend podcast, star Daisey Ridley detailed how some minor changes were made during the production of Star Wars Episode IX: The Rise of Skywalker — including one such change to the film's ending. Hamilton posted the brief interview to his Twitter this morning. Ridley related that writer/director J.J. Abrams had discussed the conclusion of the film with her before she had actually read the script, and when she finally got a copy in her hands, she noticed that a few slight "shifts" had been made. "J.J. had told me [how the movie would end], and then I read the script, and then it was sort of shifting," she said. "The ending was always pretty similar, and then I was told there was a new, I guess, a slightly different beat added [from what] I was told, which was awesome. Because it's nice to be told a thing, and then you can experience it with the filmmaker. But also, we don't always know how it's going to turn out. We did the thing on this side of the camera, but we don't know how it's going to turn out. So I'm as excited to see it as everyone else." Whatever the change entailed, it certainly doesn't sound like it was major — just a different "beat" from what Abrams originally had planned. Here's hoping that the filmmaker hasn't unnecessarily second-guessed himself, because he's had a lot of time to think about it. After manning the director's chair for 2015's Star Wars: Episode VII: The Force Awakens (which he co-wrote with veteran series scribe Lawrence Kasdan and Toy Story 3's Michael Arndt) he took a step back for the next film in the series, leaving directing and writing duties alike to Rian Johnson (Looper — the 2012 sci-fi film, not this website). Abrams has since let on that, yes, he heard the criticism lobbed at him from certain segments of the Star Wars fanbase that The Force Awakens was essentially a rehash of the 1977 original. Speaking with The Hollywood Reporter in 2016, he said, "Ultimately the structure of Star Wars itself is as classic and tried and true as you can get. It was itself derivative of all of these things that [creator] George [Lucas] loved so much… I can understand that someone might say, 'Oh, it's a complete rip-off!' We inherited Star Wars. The story of history repeating itself was, I believe, an obvious and intentional thing, and the structure of meeting a character who comes from a nowhere desert and discovers that she has a power within her, where the bad guys have a weapon that is destructive but that ends up being destroyed — those simple tenets are by far the least important aspects of this movie, and they provide bones that were well-proven long before they were used in Star Wars." A fair point — and yet, the filmmaker felt the need to rephrase it while offering a pre-emptive explanation for his approach to The Rise of Skywalker at this year's Star Wars celebration. "We've gotten a lot of flack for people saying, 'Oh, Force Awakens was just a remake of New Hope,' and while that was something that obviously was never the intention, it was about introducing new characters using the old… There's a natural sense, in any hero's journey, of certain tenets [that] will come into play. We very much wanted to make sure that we were not somehow, inadvertently, being so influenced by one thing. However, the job of [Rise of Skywalker] is to be the end of nine films. So we can't ignore the fact that we come from [every film that came before]. So it wasn't about, 'Let's choose that one, let's do a riff on that.' It was more, 'How do these stories culminate?' And that was our job." Okay, J.J., we hear you — and we trust that you'll recognize the fact that, in the end, the protests of a vocal minority just don't matter all that much when you're talking about The Force Awakens, the third-highest grossing film of all time and a near-undisputed return to form for a series that had been saddled with the baggage of three subpar prequel films. The Star Wars fanbase has always been and will probably always be a fickle one, and you'll never please them all. You're an awesome filmmaker, and we know that whatever ending you chose will be an appropriate one. That's the end of our pep talk; we just kind of felt like you needed it. Anyway, as Abrams mentioned, The Rise of Skywalker will close out the overarching narrative of the first eleven Star Wars films (yes, we're counting the "Star Wars Stories" Rogue One and Solo), after which the series will take a breather in order to regroup behind the creative team of Game of Thrones creators David Benioff and D.B. Weiss, who are rumored to be developing new films based on the Old Republic storyline which has been brilliantly fleshed out in a series of very well-received video games and novels. Apart from that, The Last Jedi's Johnson is said to be working on a fresh new trilogy as well, the ins and outs of which remain shrouded in mystery. All of which is to say that, while The Rise of Skywalker truly represents the end of a cinematic era, the multiplex isn't done with Star Wars by a long shot. You can check out the trailer for Star Wars Episode IX: The Rise of Skywalker right here, and mark your calendars: the flick hits the big screen on December 20.